While decorating the nursery is one of the most enjoyable parts of preparing for baby’s arrival, parents-to-be have a lot to consider. Creating a safe and welcoming room involves decisions on details ranging from wall outlet covers to window decorations. Think washable walls. The first thing to decide when facing that empty room is what to put on the walls. Whether you decide on paint or wallpaper, be sure that it’s washable. If paint is preferred, chose a low VOC paint, one that releases minimal volatile organic compounds, which may have adverse health effects. Fortunately, there are now many paint options that are low VOC. Don’t choose just one color. Picking a paint color can be one of the most fun decisions for parents-to-be, but don’t stop with one color. Decide on a palette of colors, so you can buy accessories and bedding in the secondary colors. Nursery paint trends for 2017 include robin’s egg blue and pale azalea pink but dramatic colors like gray and even black are also trending. The only sure color rule is to choose colors you will enjoy looking at. Flooring should be easy to clean and discourage allergies. 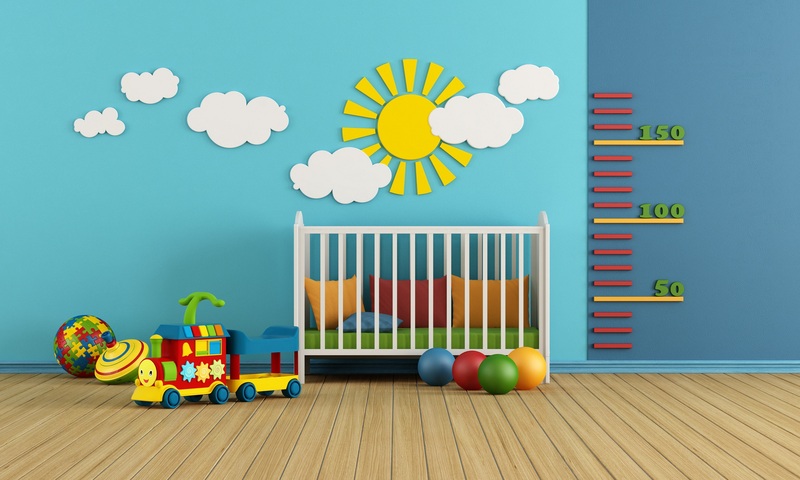 Nursery flooring choices include vinyl, wood and carpeting. Wall to wall carpeting is soft, which is forgiving when small children fall, but it can trap dust, which is a factor to consider if there are allergies in the family. Ideally carpeting should be fire-retardant and free from toxic chemicals. Opt for natural fibers such as sisal, jute, wool, or hemp. The combination of hardwood floors and area rugs is easier to clean but area rugs should be secured to discourage slips. Vinyl flooring is also easy-care and forgiving. If choosing vinyl flooring, Consumer Reports recommends flooring with a FloorScore certification that emits relatively low VOC levels. Ready to shop for furniture? The basic furniture-shopping list will include a crib, a changing table or bureau with a changing tray on top, a chair to sit in, window coverings and lighting. Crib: Whatever style of crib you choose, make sure it meets the latest safety standards set by the US Consumer Products Safety Commission. Unfortunately, some antique cribs or hand-me-downs don’t live up to current safety standards. Some parents prefer to start baby out in a bassinet, but it’s not necessary. When looking at cribs, it’s also good to know that some convert to toddler beds for extended use. Crib mattress and bedding. To minimize the chance of SIDS, The American Academy of Pediatrics recommends a firm, tight fitting mattress and discourages parents from having anything extra in the crib such as stuffed animals, bumpers or blankets. Blanket sleepers are recommended as a way to keep babies warm without loose blankets. While you will need at least a half dozen bottom sheets for the mattress, blanket sleepers eliminate the need for a cover sheet or quilt. Crib skirts look nice but are not necessary and will only be one more thing to wash during the next busy months. Changing table: Since babies need to be changed several times a day, it’s convenient to have one central place for that task. A changing table with storage space underneath can provide a convenient place to store baby essentials, such as diapers, wipes, and lotion. If there’s not enough room for a changing table, a changing top can be placed on top of a chest of drawers. Storage: New parents are often amazed by how many must-have items accompany the arrival of a baby. Infants need plenty of clothing as they may need to be changed a few times a day. They also grow through clothing sizes quickly. A nursery ideally has places to store outgrown clothes, if you plan on having another child, and clothes that don’t fit yet, as well as diapers, toys, and other paraphernalia. Baby’s clothes can easily fill an entire chest of drawers. A hamper: Potentially, every diaper change may require a change of clothing. Placing the hamper right next to the changing table or tray can make it easier to toss dirty laundry into the hamper. Chair: A comfortable nursery chair makes it easier to feed and rock the baby and later on to read a bedtime story. If there’s enough space, create a cozy corner in the nursery with access to headphones, an iPad or a book for your diversion as it can take a while for babies to drift off. What kind of chair is best? Rockers or gliders come in handy when comforting a fretful baby. Adding an ottoman means a tired mom can put her feet up. Curtains or blinds: Window coverings help control the light in the room, which can be helpful in getting baby to settle down for a nap. When hanging curtains make sure they do not reach the floor. Also, be sure the cords from the blinds cannot be reached from baby’s crib or the floor. Lighting: A nursery should ideally have one bright light for chores, such as diaper changing, and a softer light to help baby get ready to sleep. Floor lamps only work until the baby can crawl and knock them over. Then they become a hazard. Mobiles hung over the crib are a colorful way to entertain and stimulate baby, but make sure that nothing hangs low enough for baby to grab. Once the basics are assembled, arrange the furnishings for maximum convenience and efficiency. The lamp should be within reach of the comfortable chair. Diapers, wipes, changing table covers, wipes and other supplies should be reachable from the changing table or tray. Also, place the hamper, diaper pail and garbage within easy reach. For safety’s sake, cover any outlets not in use with outlet covers and secure any cabinets a baby might eventually explore with safety latches. Once the hard work of buying and arranging furniture is done, it’s time to decorate the room with wall art and toys. Ideally, all the objects that a young child can reach should be easy to clean and not be easily breakable.